Paris by Cell Phone: 2010-08-11: Where Is It Wednesday? OK, so where is this? First correct guess in the Comments gets the coveted Chupa Chups badge! To follow “Paris by Cell Phone” daily, please click here. YAY! For once the time difference to Australia worked in my favour! I feel like I should be disqualifed too though (shhh) as I haven’t really been there either. I’ve seen the bridge but not been on it. Thanks Paul. And thanks Pariskarin. 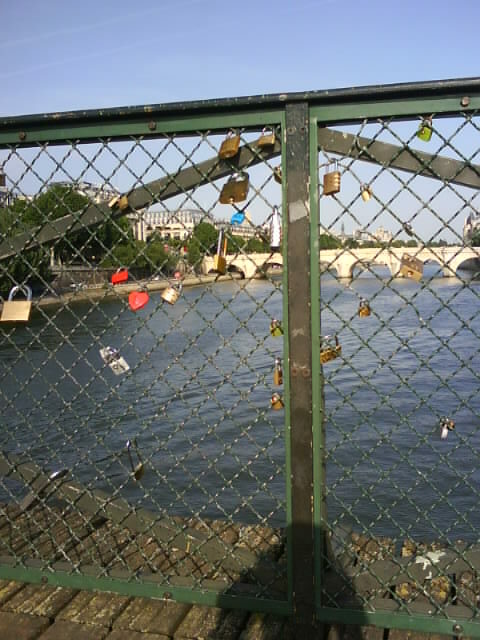 C’est le Pont des Arts! Thanks so much for stopping by. You were so close! You got the right answer but Louise answered 1st (less than an hour before you). There’ll be another shot next week! I feel like I should be disqualified as I’ve never been there, but simply have been paying attention. You coulda answered and got a DOUBLE Chupa Chups badge–paying attention counts. Still, you were a little late from the big winner. Better luck next time! J’aime les Chupa Chups! Miam-miam! Thanks so much for stopping by! I visited your blog and was very impressed with your photography. I don’t mean to shamelessly self-publicize, but my Paris photo blog is located here. You were a little late for the Chupa Chups, but I’ll link your blog on my front page, if that helps! Better luck next time. Merci, Paris Paul! I will visit often here particularly if there are Chupa Chups (wink).